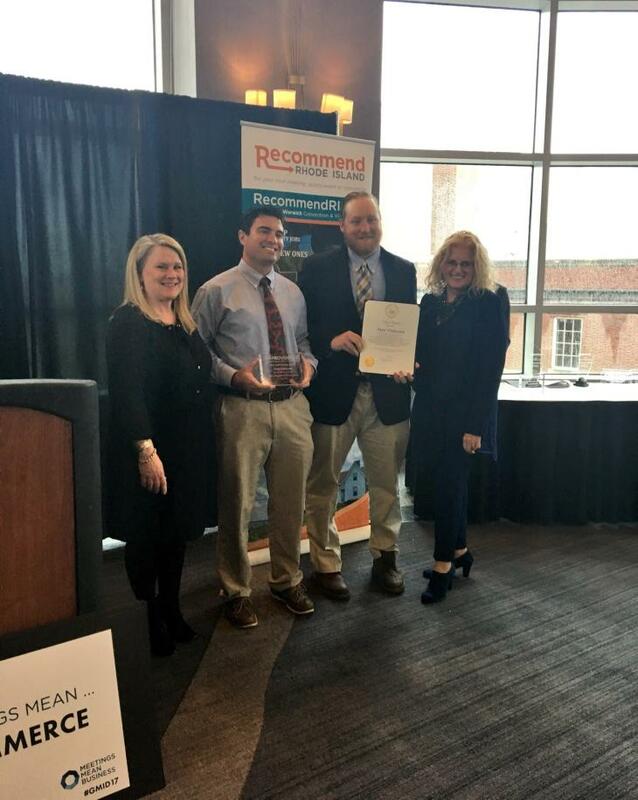 The Providence Warwick Convention and Visitor&apos;s Bureau (PWCVB) and RI Sports Commission recognized 23 Rhode Islander&apos;s for their efforts of bringing lucrative business to the Ocean State. The PWCVB Annual Awards Luncheon, held at the RI Convention Center, was to showcase the great partnerships between the CVB and the local ambassadors in the community. Providence Mayor Jorge Elorza, Providence Police Chief Hugh Clements and Providence Journal Publisher Janet Hasson were among those who received awards from the PWCVB. RI Sports Commission recognized Shannon Cornicelli (Dream Big Gym - Mardi Gras Gymnastics Invitational), Matt Finlayson and Eric Hirschbein-Bodnar (Ocean State Waves - Summer Wave Games), Brad Read (Sail Newport - Volvo Ocean Race), and Steven Pischopiello (Cranston Western Little League Baseball). Mardi Gras Invitational is one of the premier elite amateur gymnastic events in the northeast, run by Shannon Cornicelli. Every year hundreds of gymnasts and their families head to the RI Convention Center to compete over 3 days. This past year&apos;s event also included a college club meet, with teams from the University of Rhode Island, University of Connecticut, University of New Haven, and Boston University. Ocean State Waves President & General Manager, Matt Finlayson, along with Waves Assistant GM and Salve Regina University Assistant Coach, Eric Hirchbein-Bodnar (pictured above) hold their annual Summer Wave Games at multiple fields all over Rhode Island. This tournament held the week after July 4th, attracts hundreds of 17U regional prospects and their families providing a direct spend impact of $357,000 to the economy. Sail Newport CEO, Brad Read, (pictured below) has been essential in making Newport the only North American stopover for the Volvo Ocean Race. The stopover was a month-long event that included everything from high-level corporate events to the family-friendly Race Village. With more than 100,000 visitors, spectators, and sailing enthusiasts from all over the world, the race event brought in almost $43 million to the Rhode Island economy. The Volvo Ocean Race starts in October of 2017 and returns to Newport again in May 2018. Steven Pischopiello, the President of Cranston Western Little League Baseball is a great local ambassador who helped secure Rhode Island as the venue for the Little League 9-10 East and Mid-Atlantic Championships. Some of the best teams in the nation come to the Western Cranston Little League Complex to fight for a shot at the title of regional champion. This great event will be back in 2017 and take place the first week in August.